Hi, this is Tamotsu Todoroki. I am a car advisor of PicknBuy24.com. I write an online column every week to take care of your vehicle. My column is all about something useful and practical for your vehicle. Please have a look once to keep your car in good condition. The investment you make in your vehicle includes the purchase and maintenance of your tires. Therefore, it is important to avoid getting a flat tire. Avoiding a flat tire can save you money and allow you to get the most out of your tire investment. There are many things that you can do to help you avoid getting a flat tire. 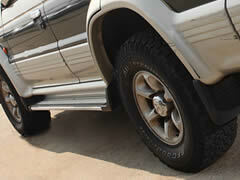 In order to avoid any surprises related to a flat tire, it important to check your tires regularly. You will want to check the tread depth of your tires as well as how the tread on your tires is wearing. Uneven tread wear can cause difficult driving and the need to replace your tires earlier than necessary if taken care of properly. In addition, you will want to check the tire pressure to make sure that you have the optimal amount of air in your tires. Check your owner's manual for the recommended tire pressure for your vehicle. Over-inflated and under-inflated tires are some of the most common reasons for tire blowouts. Since most cars manufactured after 2007 have built-in tire pressure gauges, you will likely be given an indicator light if your tires are not inflated properly. Be sure to pay attention to your warning lights and regularly check the tire pressure. Rotating your tires on a regular basis can help ensure that the tread on your tires is wearing evenly, which can increase the life of your tires. In addition to providing you with a smoother drive, rotating your tires regularly extends the life of your tires, wheels and brakes. Though your owner's manual will indicate the recommended mileage at which to rotate your tires, in general you will want to rotate them every 5,000 to 8,000 miles. Having your tires rotated regularly also gives a professional the opportunity to inspect your tires and alert you to any problems or damages. It is important to be aware of where you drive at all times. There are many hazards that cause wear and damage to your tires. If you must drive regularly on unpaved road, for instance, you may find that the uneven surface and debris can cause wear and tear on your tires. In addition, if there is construction near your home or a place that you drive often, you will want to inspect your vehicle's tires for nails as well. You need to be aware also that the tires on the right side of your vehicle are more prone to issues due to hitting curbs and the edge of the road; therefore, it is important to check these tires more frequently. One concern that many vehicle owners do not consider is the danger of tire rot. Tire rot is most commonly found in older tires or on cars that are not driven often. If you have an older car with older tires, you will want to watch the tires for signs of developing tire rot. In addition, if you have a vehicle that you only drive periodically, you will want to make sure you check the tires prior to driving it each time. The most common indication of tire rot is small cracks in the tire's sidewall. If you suspect tire rot, it is best to have a professional inspect your tires immediately. Tire rot can cause a blowout quickly, with little notice. No matter what type of vehicle you drive, tires can be a big investment for you each time they need replaced. Therefore, it is important to avoid getting a flat tire. In addition to being costly, having a flat tire can also cost you time and cause undue stress. Therefore, regularly taking precautions to avoid getting a flat tire can be important to every vehicle owner, saving you time, money, and stress.